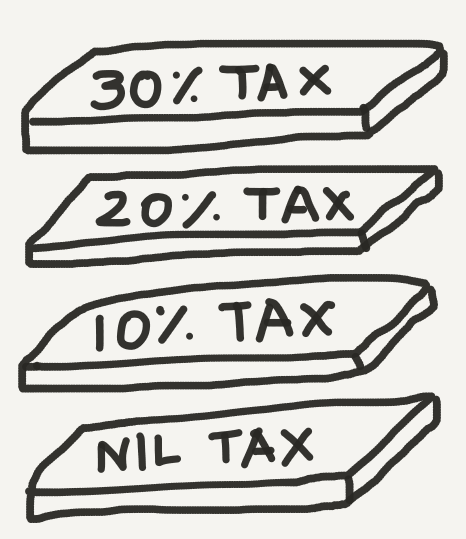 Income Tax Slabs – “Slabs”, get it? Taxes are an integral component of any country’s budget. You are liable to pay tax even if you earn a single Rupee in India (whether it is earned legally or illegally). I am starting a new series of articles on Income Tax for individuals. This the first of the series and we will try to understand why we need to pay income tax and the different income tax slabs. Why does the government need taxes? The government earns most of it’s income from the taxes paid by companies and individuals. This money earned is used for the benefit of the people by building better infrastructure, welfare schemes, education institutions, etc. I am assuming you are an individual who earns a monthly salary or has a small business. We are going to concentrate on income taxes and there are multiple levels of tax rates. The income tax slabs I have mentioned here are for the financial year 2016-17. For FY 2017-18, the income tax slabs are a bit different – where the 10% slab has been decreased to 5%. Lets assume you have a total taxable income of Rs 8,00,000. This income has been calculated by including income from all sources such as salary, rental income and interest income. Now lets calculate how much taxes are due for FY 2016-17 (AY 2017-18). Now for the same salary for FY 2017-18, since the 10% tax has been reduced to 5%, lets see how much difference it makes? Not a huge saving compared to the current financial year. But still, so much money is being paid as tax? No way! So much of your hard-earned money is being paid as taxes. Before calculating the taxes, you should also know that the government does provide certain provisions using which one can lower their taxes paid. These are called tax deductions and they are legal methods on paying lower taxes. The deduction one is eligible for depends on a number of factors, with different limits set for different purposes. Depending on the type of tax deduction you claim, the amount of deduction varies. There are sections of the tax law where you can claim tax deduction for amounts spent in tuition fees, medical expenses and charitable contributions. You can also invest in various schemes such as life insurance plans, retirement savings schemes, and national savings schemes etc., to get tax deductions. By providing these deductions the government is incentivizing the citizens to save more money and spend it on activities that has social benefits. In the next articles, we will look into the different deductions that are possible to save on tax. The first of which is the most popular section 80C.